As a teenager, my parents encouraged me to play the guitar! I love the guitar. I love the sound it makes. I love listening to it , teaching it and playing it! I also play the ukulele! Most of the popular songs I play, are my own arrangements. I feel arranging music makes it more personal for you and I can offer a more variety of songs! Playing at weddings is such a blast. It is great to see families and friends enjoying each other! I have performed at a variety of private events including The Traverse City Public Library, Boones Resturant and The Traverse City Opera House. Public events include The Traverse City Camera Club, Park Place Dome, Horizon Shine Cafe and Borders Books and Music. 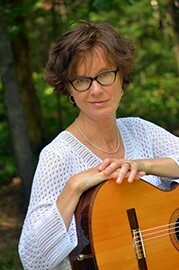 I taught Classical Guitar and Beginning Guitar Classes for the Adult Extended Education and The College for Kids program at Northwestern Michigan College in Traverse City for seven years. and I, have two children and a dog named Buster. All five of us live in northern lower Michigan. 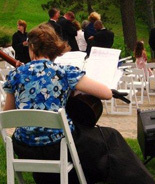 I just wanted to thank you for being so flexible and playing so beautifully at our wedding in Port Oneida. It really made the day so special and memorable. Your willingness to learn new songs and to haul stuff down to play on the beach was above and beyond what other musicians might do. I highly recommend you to anyone getting married in the area and I wish you well! I wanted to check in with you after our wedding. I never got a chance to really talk to you at the wedding with everything going on. I wanted to let you know what a wonderful job you did and how much we loved everything! It was perfect and exactly what we wanted. Thank you so much for being there for us! Enjoy the rest of your summer!" "Just wanted to say a quick thank you for your wonderful performance on Saturday! You helped make the evening even more special for Pam and me. We will be sure to recommend you to future couples"
"We had such a wonderful day! Thank you and we will be in touch for future events. You music was beautiful!! As they say in France...bisous"
For more music samples, please visit the Music Samples page.